Here is a great paper with detailed archeology of beads used for personal ornaments from 82,000 years ago! Recent investigations into the origins of symbolism indicate that personal ornaments in the form of perforated marine shell beads were used in the Near East, North Africa, and SubSaharan Africa at least 35 ka earlier than any personal ornaments in Europe. Together with instances of pigment use, engravings, and formal bone tools, personal ornaments are used to support an early emergence of behavioral modernity in Africa, associated with the origin of our species and significantly predating the timing for its dispersal out of Africa. Criticisms have been leveled at the low numbers of recovered shells, the lack of secure dating evidence, and the fact that documented examples were not deliberately shaped. In this paper, we report on 25 additional shell beads from four Moroccan Middle Paleolithic sites. We review their stratigraphic and chronological contexts and address the issue of these shells having been deliberately modified and used. We detail the results of comparative analyses of modern, fossil, and archaeological assemblages and microscopic examinations of the Moroccan material. 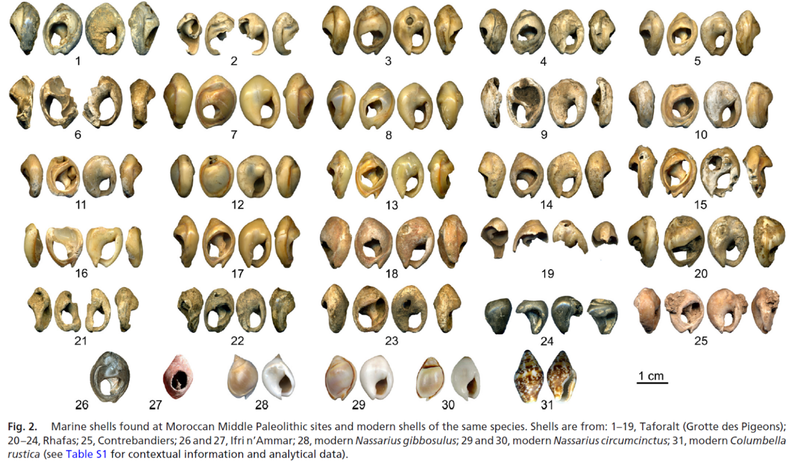 We conclude that Nassarius shells were consistently used for personal ornamentation in this region at the end of the last interglacial. Absence of ornaments at Middle Paleolithic sites postdating Marine Isotope Stage 5 raises the question of the possible role of climatic changes in the disappearance of this hallmark of symbolic behavior before its reinvention 40 ka ago. Our results suggest that further inquiry is necessary into the mechanisms of cultural transmission within early Homo sapiens populations.